MONASH University hosted an international conference on Business, Environment, International Competitiveness and Sustainable Development of the Asia Pacific Economies, held at Sunway Lagoon Resort, Malaysia on December 3-4, 2007. 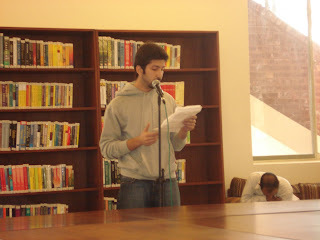 Lahore School students presented their research papers in the conference. Aamir Saleem presented “Bankers’ Perception toward the Factors Affecting the Adoption of E-Banking Technology in Pakistan” whereas “Production of Thermo-electric Power from the Solid Wastes of LUMS” written by Dr. Muhammad Rafiq Khan (Senior Research Fellow), and Mehreen Kamal was presented by Mehreen Kamal. Given the roots of Language Culture and Society are deeply entrenched in traditions spanning over hundreds of years, Lahore School Language Culture and Society Program has also become very traditional. Every year students of this course do their projects showing how these three societal elements are interlinked with each other and how they can help society in other areas of human activities including business. Like previous year, the class projects were presented in Main Cafe where students exhibited their posters and creative writings. Students also explained their research projects. The colourful presentations were attended by the Rector Lahore School of Economics Dr. Shahid Amjad Chaudhry and some of the senior faculty members. Attif Bajwa, the President and CEO, MCB visited the Lahore School of Economics on December 5, 2007 and gave a lecture to the Lahore School students of MBA / MSc (Economics). Apart from students, the Distinguished Lecture was also attended by faculty members. 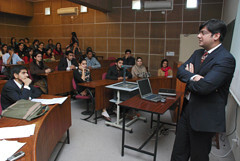 Bakhtiar Khwaja, the Executive Incharge Human Resource Division, Bank Alfalah Limited visited the Lahore School of Economics on December 5, 2007 and gave a talk to students of MBA / MSc (Economics). The lecture was followed by an informed questions and answers session. Prof. Anwar Syed conducted a seminar on “Building and Preservations of Institutions” on December 4, 2007 at the Lahore School of Economics Centre for Economics and Business Research. 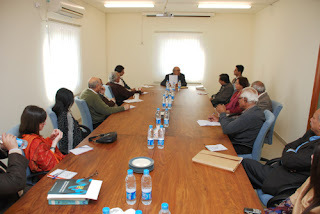 The Seminar was attended by Lahore School research fellows and the faculty members. M.Yasir Siddique, a graduate of Lahore School and now Remuneration Manager Nestle Pakistan visited Lahore School of Economics and gave a talk to MBA / MSc (Economics) students on December 3, 2007.